Bonesupport shares have had an impressive run, having more than doubled (up 116%) since our June initiation. Management presentations at recent Capital Markets Days in Stockholm and London suggest the company is at an early stage in its plans to exploit the full potential of CERAMENT and wider opportunities in the global bone void filler market. A key outcome of the summer’s strategic review was a focus on strengthening and optimising the US and European commercial footprint. 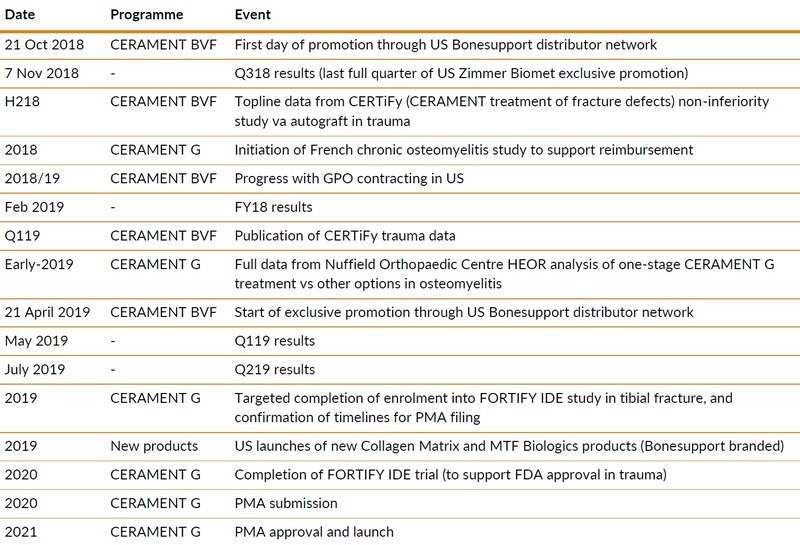 This solid commercial foundation, coupled to near-term clinical and HEOR data read outs, should enable Bonesupport to leave behind a challenging 2018 and transition to a new growth phase from 2019. We upgrade our valuation by c43% to SEK1,892m (SEK37/ share) on the back recent progress and better growth prospects. Significant investment in commercial footprint An expanded, experienced and focused sales platform is central to achieving the >40% sales CAGR target from 2019. In the US, the new direct sales model (18 independent distributors with 425 reps) should return CERAMENT BVF sales to growth, improve margins and market access ahead of new product launches – in particular, potential CERAMENT G US launch in 2021. In Europe, 7 of the planned 13 new hires are in place, improving coverage of key hospitals in focus markets (eg Germany) and in trauma. Clinical and HEOR data to amplify KOL and payor support Marketing initiatives to build KOL support in key regions are planned around Level 1 trial read outs. Top-line CERTiFy data (late-2018) could position CERAMENT BVF as the new standard of care in trauma. FORTIFY recruitment remains on track for planned CERAMENT G PMA filing in 2020; positive outcomes from this study coupled to health technology assessment will determine reimbursement, pricing, and uptake. Market led approach to innovation Moving from one platform to a broad product offering will transform Bonesupport into an orthobiologics player addressing more segments of the global bone graft market. 2019 will see US launch of synergistic (osteogenic/osteoinductive) products acquired from Collagen Matrix and MTF Biologics. Alongside this, the next wave of launches will include new CERAMENT formulations and procedure kits for a range of indications, while innovative osteoinductive products from the proprietary pipeline are a longer-term prospect. Valuation upgrade to SEK37/share We have revisited our forecasts given significant near-term commercial investment and increase mid- and long-term sales. We continue to use a three-phase DCF methodology (explicit 5-year forecasts to 2022, a 10-year trending period and 2.5% terminal growth rate) with a 12.5% discount rate. This generates a SEK1,892m ($218m) or SEK37/share valuation. Near-term upside potential comes from commercial execution, CERTiFy data and new US product launches. FORTIFY is the key longer-term growth driver. Bonesupport is a Swedish ortho-biologics company focused on developing and commercialising a pipeline of unique injectable drug eluting bioceramic bone graft substitutes based on its proprietary CERAMENT technology. Bonesupport has embarked on several new initiatives to accelerate US and European market penetration of CERAMENT, its unique injectable drug eluting synthetic bone graft substitute, and sustainably boost sales. 2018 is a year of transition, with the company having defined and started to implement a focused 5-year growth strategy that aims for a sales CAGR of 40+% from 2019 onwards. Recent Capital Markets events in Stockholm and London were a first opportunity for management to outline the findings of the strategic review carried out over the summer, and to provide more detail on next steps for Bonesupport as it seeks to become a global orthobiologics leader. It also allowed the company to showcase CERAMENT’s unique value proposition and to demonstrate the depth and breadth of management. In addition to the CEO Emil Billbäck, presentations were given by two key opinion leaders (Anders Jönsson, Senior Consultant Orthopaedic Surgeon, Sahlgrenska University Hospital; and Professor Venu Kavarthapu, Senior Consultant Surgeon, Kings College Hospital, London), as well as by Björn Westberg (CFO), Dr Michael Diefenbeck (Head of R&D, Medical and Clinical Affairs) and Patrick O’Donnell (EVP Commercial Operations North America). ‘Focus’ is the guiding principle for Bonesupport; while the company appreciates the broad applicability of its products, it has now clearly defined the activities that will have maximum influence on its longer-term growth potential. This strategy addresses the three pillars of Bonesupport’s business model: (1) innovation, (2) leading clinical evidence and HEOR (health economics outcomes research) data, and (3) effective commercial platform. We consider each in turn and expand on these later in our report, highlighting here the significant progress in optimising the US and European commercial footprint. Prioritising commercial execution is likely to have the greatest impact on growth in the short-term as well as laying firm foundations for future growth. Recent investment in expanding the global footprint, and greater emphasis on penetrating the market opportunity in complex trauma, means it is well positioned to benefit from Level 1 clinical data. 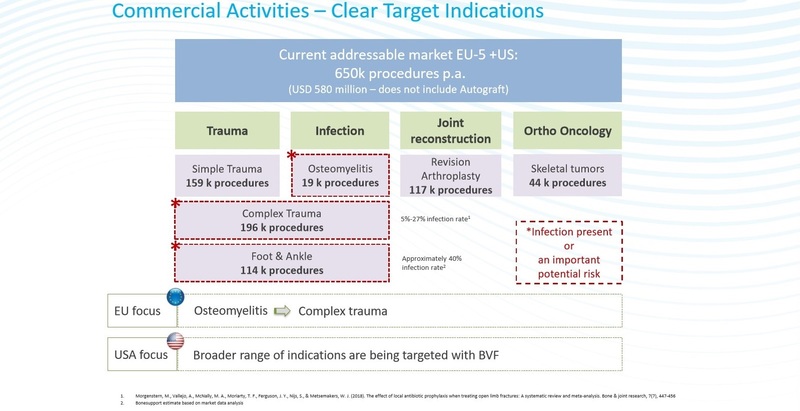 Data from both the CERAMENT G FORTIFY trial (2020) and the CERAMENT BVF CERTiFy trial (late-2018) should accelerate sales by providing competitive differentiation in the large trauma market. In the US planned launch of CERAMENT G in 2021 (assuming PMA approval) will represent a key inflection point for Bonesupport. In the interim, the company will benefit from operational leverage through US launches of new complementary products (acquired from Collagen Matrix and MTF Biologics) in 2019, followed by new CERAMENT presentations. This strategic roadmap should allow Bonesupport to leave behind a period of uncertainty associated with the impact of Zimmer Biomet hardware supply issues on 2017 and H118 US sales, and with the subsequent termination of this distribution agreement. 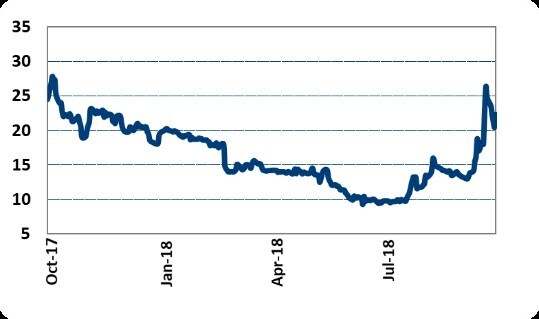 This uncertainty had weighed on share price performance (reaching a low of SEK9.04/share in June); however, the rally since late summer is testament to a wider appreciation of the strategy and growing confidence that management can deliver on CERAMENT’s growth potential. We believe there is further significant upside potential from successful execution, with multiple catalysts (Exhibit 1) over the next 6-24 months. Bonesupport’s CERAMENT platform has a unique value proposition and is well positioned to address three of the key challenges in orthopaedics: management of bone loss, bone voids, and bone infections. CERAMENT additionally has two key differentiating properties vs other synthetic bone void fillers. It is clinically proven to remodel into host bone within 6-12 months (treating bone loss and/or bone voids); and can elute drugs/biologics directly into the bone void (treating infection with local rather than systemic antibiotic delivery). CERAMENT’s properties emanate from its chemical composition: it is a 40:60 blend of hydroxyapatite (HA) and α-calcium sulphate hemihydrate powder. This means it closely resembles human bone, and balances implant resorption with new bone in-growth to support optimal bone healing. CERAMENT BVF, the basic bone void filler (key markets are US and Europe), and CERAMENT G and V (Europe), which elute the antibiotics gentamycin and vancomycin respectively, have broad applicability across various orthopaedic indications. Expert opinion is that CERAMENT G/V could, over time, become a new standard of care as it permits one-stage management of bone infections. Key opinion leader (KOL) presentations highlighted important features which mean it is straightforward to integrate CERAMENT into existing practice. The closed-mixing system is easy to use; it is drillable (critical for use with hardware in trauma); radiopaque (facilitating use in minimally invasive surgery); and sets isothermically (no risk of thermal tissue damage). CERAMENT is injectable, mouldable, and compatible with various needle sizes enabling complete filling of voids of all sizes, without necessitating further bone loss through increasing the diameter of the entry hole/cavity. Bonesupport pursues a market-led approach to innovation and continues to invest to ensure that it has a highly differentiated and relevant product offering. CERAMENT has many positive attributes, but the key limitation of the available products is that they address only one of the three mechanisms via which bone tissue regenerates and replace the implanted graft (osteoconduction). Bonesupport is exploring and exploiting opportunities to broaden its product offering with synergistic products (with osteogenic and/or osteoinductive properties) to capture of a larger share of the overall bone graft market and support long-term sales growth. Near-term opportunities are complementary products for the US market, such as those recently acquired from Collagen Matrix and MTF Biologics (Exhibit 2). These Bonesupport-branded products, which have a different mechanism of action to CERAMENT BVF (osteoconductive), will be launched in 2019. They could also form the basis to develop new combination products with dual-mechanisms. Further strategic deals of this type could be concluded. In the mid-term, Bonesupport’s product expansion is focused on new CERAMENT formulations, combinations or presentations (procedure kits) for a range of indications. Surgeons need a complete kit (metal hardware, screws, synthetic bone substitute) to carry out a procedure, hence bundled offerings have a convenience, time, and profitability advantage. In the US, any product that can be sold at the same sales call point in the same indication is potentially synergistic with CERAMENT, therefore we expect to hear more in the future about this product category once tie-ups with hardware manufacturers have been closed. Lastly, longer-term opportunities should emanate from Bonesupport’s in-house research into novel osteoinductive products designed to enhance bone growth. This innovative pipeline consists of four products that exploit CERAMENT’s drug-eluting properties by combining it with approved therapies (bisphosphonates such as zoledronic acid, and bone morphogenic proteins) or stem cells (bone marrow aspirate). These potentially first-in-class products could command higher reimbursement and pricing. The first is expected to enter the clinic in 2020. Bonesupport is applying a big pharma approach to orthopaedics market with a data-driven strategy to improve reimbursement and accelerate CERAMENT penetration into both existing and broader indications. Its extensive data set, including more than 150 peer reviewed publications and abstracts, is industry leading and provides compelling evidence to support the utility of CERAMENT and its positioning vs alternatives. Data includes case studies and trial registries and will soon include Level 1 evidence from ongoing randomised clinical trials. Very few other orthopaedic companies have made similar investment in clinical data; a 2013 literature review reveal that 63% of marketed bone graft substitutes do not have any clinical data. Trauma is a major market opportunity for CERAMENT. Bonesupport is investing in two major studies to compare clinical outcomes versus (BVF) or on addition to (G) standard of care, and to support US approval of CERAMENT G. Positive data will shine a spotlight on CERAMENT’s benefits vs alternatives, support reimbursement, and show a positive impact on hospital costs; all of which should drive increased usage by KOLs and larger orthopaedic trauma centres. CERTiFy, a 136-patient study across 20 German trauma centres, is Bonesupport’s first large randomised prospective trial in trauma (tibial fracture). It is a non-inferiority study comparing CERAMENT BVF vs the gold standard autograft on several endpoints (pain, quality of life, costs of care). Autograft (patient-derived bone graft) is a two-step procedure (harvest and graft), that is often associated with pain at the donor site. CERTiFy is fully enrolled; top line data is expected late-2018, with publication of full study results in early-2019. FORTIFY, a 230-patient study across 30 global trauma centres, is evaluating the addition of CERAMENT G to standard of care (intermedullary nail) in surgical repair of open diaphyseal tibial fractures. It has been designed to demonstrate efficacy of CERAMENT G in a complex, yet common, trauma indication where patients are at risk of developing bone infections. Positive data would provide proof of concept for prophylactic use as an add on to standard treatment. FORTIFY is enrolling to plan; recruitment is expected to complete in 2019, and one-year follow up will be available in 2020. This data will form part of the FDA submission of the final PMA module for CERAMENT G in the same year. Data from both trials will also support improved reimbursement of CERAMENT in trauma. CERAMENT BVF’s bone remodelling properties, combined with similar (better) clinical outcomes to the current gold standard, at a cheaper cost and without associated disadvantages of autograft, would be a very attractive proposition for surgeons and hospitals. CERAMENT G’s antibiotic eluting capabilities provide significant additional benefit in improving and protecting the bone healing process by reducing incidence of complications (eg fracture non-union and deep infections) that can lead to hospital readmissions. CERAMENT G/V’s ability to treat chronic bone infections, and to lower the risk of infection and hospital readmissions in high risk injuries, is an important differentiator in a healthcare market that is moving towards a goal of reducing surgical time (and total cost of care) while delivering improved patient outcomes. Bone infections have a significant impact on healthcare costs, with the primary determinant of this cost being the length of stay in hospital, whether for initial treatment (Exhibit 3), or readmission to treat secondary infections or other complications. CERAMENT G has been shown to benefit both patients and hospital resources by reducing the length of stay through a successful one-stage surgery. A 100-patient prospective study (McNally et al, 2016) showed CERAMENT G eradicated infection in 96% of patients with chronic osteomyelitis in a single stage procedure. CERAMENT G focused HEOR is underway in Europe and the US, with the results of these analyses intended to support reimbursement. Detailed economic analysis from a 5-year study led by the Nuffield Orthopaedic Centre (Oxford University Hospitals) will become available in early-2019. Initial data indicated that use of CERAMENT G in osteomyelitis reduces surgical time and the procedure rate, compared with the full range of alternative treatments available in England. This data also has relevance across the continent as Bonesupport seeks to improve reimbursement with incremental coding (eg it is pursuing a ZE code in Germany) as well as development of tools to streamline the filing process. HEOR activities are central to CERAMENT G US launch preparations. Bonesupport has initiated a review of reimbursement and access options and intends to generate a Health Technology Assessment (HTA) publication plan based on FORTIFY data, including 28-day readmission rates, total length of stay and adverse events costs. We highlight that 30-day readmission rates are frequently used as a quality of care metric as serious complications are often associated with readmission. The increased cost of treatment coupled with potential penalties under the Hospital Readmission Reduction Program of the Affordable Care Act can significantly impact hospital profitability, hence the HTA will be critical in determining reimbursement, pricing and uptake. The current addressable market for CERAMENT, excluding dental, spine and cranio-maxillofacial applications, is c650K procedures per year, although only a third of these utilise synthetic bone void substitutes. Autograft and allograft (donor bone) remain the favoured options in Europe, each representing c30% of procedures, despite the drawbacks associated with a painful two-surgery procedure (autograft), and risk of disease transmission or graft failure (allograft). Use of DBM is more common in the US (again 30% of procedures) compared with Europe (5%), reflecting differences in clinical practice whereby a ‘cocktail’ of several bone graft substances is typically used in the US vs a single type in Europe. Exhibit 4 illustrates Bonesupport’s segmentation of the addressable opportunity into four defined target indications. Gaining market share from autograft/allograft will take time, although the company has identified immediate opportunities to take share from other synthetic bone void fillers – particularly in trauma and osteomyelitis – and grow sales through optimisation of the commercial platform. The decision to terminate the US CERAMENT BVF distribution agreement with Zimmer Biomet was a strategic move to re-gain control of its commercialisation in the largest orthopaedic market globally. It is being replaced by a direct sales model which brings several benefits to Bonesupport including improved margins (by 15-20 percentage points on gross sales), greater influence over distribution channels (not restricted to Zimmer Biomet call points), and the ability to access a much larger market opportunity. Importantly, the switch to a direct model means that Bonesupport will have an established and fully operational US platform with a highly motivated focused sales force ahead of launch of CERAMENT G in 2021. Ahead of launch it will support educational activities to communicate the value proposition of the CERAMENT drug-eluting portfolio and to develop a large potential customer base to ensure a rapid launch trajectory for CERAMENT G.
On expiry of Zimmer Biomet’s exclusivity on October 21, direct US distribution of CERAMENT BVF will begin through a newly recruited network of 18 independent distributors (totalling 425 sales reps). This network covers c85% of the base US CERAMENT BVF business under Zimmer Biomet, and from April 21, 2019, will be the sole source of CERAMENT BVF in the US. The timing of planned expansion to up to 25 distributors will depend on progress with sales penetration, in terms of both territories and indications. Bonesupport has also expanded its US commercial team to 21 individuals (up from 12 at end-2017), with recruitment of a further 6 experienced hires anticipated by year-end. This commercial team has been working with external consultants to put in place the infrastructure to support CERAMENT BVF sales growth, including enhanced market access. Contracting with key US purchasing organisations is a priority to ensure that CERAMENT is widely available. The aim is to secure Bonesupport-specific contracts, with an initial focus on large GPOs (group purchasing organisations) whose hospital members have previously purchased CERAMENT BVF (such as Vizient, which has 3.3k hospital members, and Premier Health and Health Trust, with 1.2k members each). Future announcements confirming that GPO contracts have been secured are expected. Bonesupport’s US commercial strategy presents opportunities for operational leverage through a broader product offering (initially from Collagen Matrix and MTF Biologics). A product portfolio will also improve Bonesupport’s competitive positioning with healthcare GPOs and integrated delivery networks (IDNs). Bonesupport sells CERAMENT direct in five European countries (UK, Germany, Switzerland, Sweden and Denmark) and through speciality distributors in 8 other non-US countries. Plans to nearly double the direct European sales organisation from 14 in 2017 to 27 by end-2018 are on track, with the first 7 hires having been made. This expanded sales capability should enable better penetration of major markets (e.g. Germany) and add impetus to the plan to prioritise major indications (e.g. trauma). This investment in European sales is likely to reap rewards in a relatively short timeframe. New hires are experienced and are being deployed in key regions with important orthopaedic centres but where Bonesupport currently has limited presence. Exhibit 5 illustrates this concept of untapped potential in Germany, where a regional sales director has been hired for the northern region, as well as 3 sales reps covering Berlin, Dresden and Frankfurt/Cologne. Additionally, a regional sales director has been hired for Southern Europe (Spain, Italy, France and Portugal), and 2 other sales reps (Southern UK; Stockholm/North Sweden). Two further reps will be hired in the Nordic region. Other commercial initiatives to drive productivity include online training for both direct sales and distributors, and performance metrics for distributors. The ultimate goal is to increase penetration and sales of CERAMENT G/V (which currently represents c75% of European sales) in Europe, where it has established a foothold in chronic osteomyelitis based on the strength of clinical data and KOL support. There is scope for further penetration in this indication, however, more resources are being directed towards the underpenetrated and 10x larger market opportunity presented by complex trauma. We have revisited our forecasts (Exhibit 6) following the clear roadmap for future growth provided by management at the Capital Markets events. Importantly, the confirmation that key experienced commercial hires have already been made in both the US and Europe, provides us with more confidence of delivery to plan. We continue to view 2018 as a year of transition, with short-term uncertainty surrounding US CERAMENT BVF sales in Q3 (cancellation of Zimmer Biomet orders as it runs down its inventory) and Q4 (the first 10 weeks of direct sales). We make minor changes to 2019 and 2020 forecasts but revise our longer-term assessment of CERAMENT G’s prospect in Europe and the US. This is driven by our greater appreciation of KOL support, potential impact of strong FORTIFY data and HEOR, and the recent approval by Health Canada. We expect first sales in Canada through a yet to be secured distributor in 2019. More meaningful changes have been made to cost assumptions. We increase our forecast R&D spend in connection with FORTIFY in 2019/20 (now SEK 77.2m and SEK 74.1m, up from SEK 66.2m and SEK 68.9m respectively), and also fine-tune the sales costs (2019: now SEK 187.7m from SEK 160.5m; 2020: now SEK 230.9m from SEK 195.8m) to reflect the timing and magnitude of commercial expansion and well as tweaks to our US margin assumptions for CERAMENT given confirmation of sales commission of 30-35% of sales (reported as SG&A). We have updated our valuation to reflect changes to forecast assumptions as well as rolling forward our model to reflect the passage of time, and updating the number of shares outstanding. Our three-stage DCF methodology now values Bonesupport at SEK 1,892m (SEK37/share), up c43% from SEK1,325m (SEK26/share) previously. Our valuation is based on explicit cash flows to 2022, followed by a ten-year trending period, and a 2.5% terminal growth rate. We forecast sales for all currently marketed CERAMENT products in Europe/RoW and the US, also including CERAMENT G in the US. For the latter we assume launch in 2021 and apply a 75% risk adjustment to recognise clinical and regulatory risk. Individual product rNPVs are summed and netted against the costs of running the business. 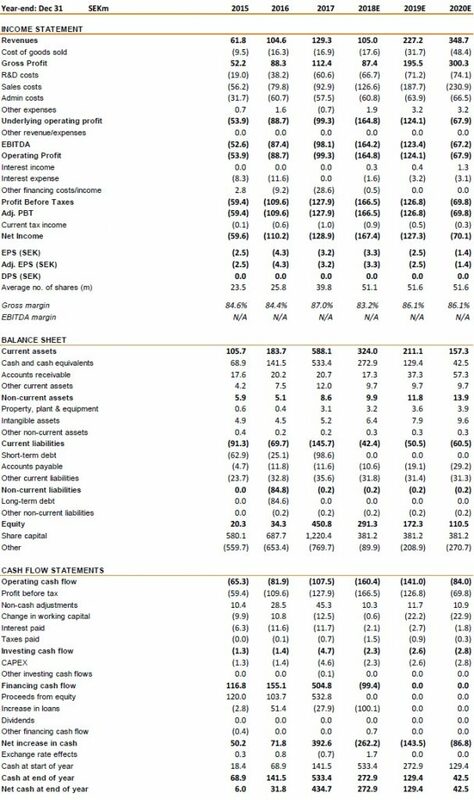 Exhibit 7 provides a detailed breakdown of the components of our valuation. Continued successful execution (eg commercial traction, success of additional products) would unlock further upside potential. The impact of CERTiFy on trajectory of BVF sales in trauma, and US approval of CERAMENT G are two key inflection points. For the latter, removal of the risk adjustment on CERAMENT G (US) would lift our valuation to SEK2,062 m (SEK 40/share). Additionally, we continue to apply a 12.5% discount rate to reflect the fact that Bonesupport is a small company operating in a highly competitive market; using a less conservative discount rate of 10% results in a higher valuation of SEK 3,005m (SEK 58/share).